Rose Elliott devised the vegetarian low carb diet back in 2005. Rose is British, has an MBE and is an accomplished writer on all things vegetarian. This vegetarian diet for weight loss claims to help you lose weight fast and without hunger. The vegetarian weight loss plan is suitable for all types of vegetarians, even aspiring ones. On this diet you will be eating lots of vegetables, foods containing protein such as nuts, eggs, cheese, quorn etc. and healthy fats. If you are a vegan, then the book is for you as well. Like most low carb meal plans, they are driven by the fact that most people simply eat too many carbs, and also a lot of bad carbs. This diet however, wants you to find the right balance of good carbs, protein and healthy fats such that you can maintain your target weight. How many diets allow you to eat cheese, butter, mayonnaise and avocados! Ms Elliott believes the days of the high carb, low fat diet are over, as they simply do not work, especially for the western diet, as we are too reliant on pizza, pasta, cakes, sugar etc. Improvements reported from the low carb vegetarian diet include lowering blood pressure, a rapid reduction in bad cholesterol, and improved blood sugar levels, not to mention weight loss. Rose believes that if you replace the excess carbs you are eating with healthy fats, it will greatly benefit your bad vs. good cholesterol levels. Rose does not make claims on how much weight you will lose, however, she has had reports from people who have followed the diet, one losing 6-7 pounds in the first 2 weeks, and another who lost 14 pounds. One lady reported losing 95 pounds, another 60 pounds when they followed the diet. Please note that this diet should not be followed if you have advanced kidney disease, Rose warns, and advises to see your physician first. She states that if you replace the excess carbs you are eating with healthy fats, it will greatly benefit your bad vs. good cholesterol levels. The diet comes in 3 phases: carb cleanse, continuing weight loss and maintenance. Phase 1: When you start carb cleanse, you are restricted to 20g of carbs per day. This is net carbs. To calculate net carbs, you need to deduct the fiber content as it does not affect your blood sugar levels. So if the item you’re purchasing contains 10g of carbs and 5g of fiber, then the net carbs is 5g (10g-5g). The first phase lasts for a minimum of 2 weeks, although If you wish you can stay on the first phase for as long as you like. This phase will rapidly alter your metabolism. Within 2 days the store of carbs in your body will have gone, and now you will burn fat. Your craving for sugar will go. Phase 2: The second phase continues until you reach your target weight. Your weight loss will slow to 1-2 pounds per week. You’ll be adding an additional 5g of carbs to your diet each week. The idea is to find how many carbs you can eat so your weight plateaus. If it does plateau and you still want to lose more weight, then remove 5g of carbs and continue on. Phase 3: Following this phase you move onto maintenance. Rose stresses in her book that the transition to the last phase is very important and is key to successfully keeping the weight off. She explains how to do it. The book provides low carb vegetarian recipes and very clear, simple menus to follow each day. 200g (7 oz.) spinach, cooked. 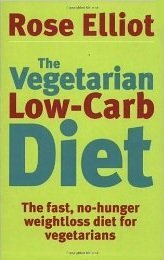 The Vegetarian Low Carb Diet book is available at a discounted price from amazon.